The other day I was watching a friend use her iPhone and I was surprised that she didn’t know a few iPhone Shortcuts and tips that I take for granted! I showed her some of these tips, and thought, well maybe she’s not the only one who doesn’t know about them. You’re texting with a friend and decide it might be easier to have a verbal conversation. You might switch from the texting app to the phone app, look up the contact, and then press the call button. You can tap the little round button with their photo or initials, and then tap “Audio” or “Facetime”. You’re reviewing your email, and you’ve received an email with a link. You tap the link and it opens up in Safari. 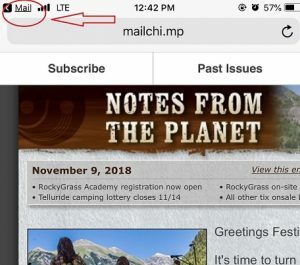 When you’re done reviewing the page, you close Safari and reopen your Mail app to continue reviewing emails. 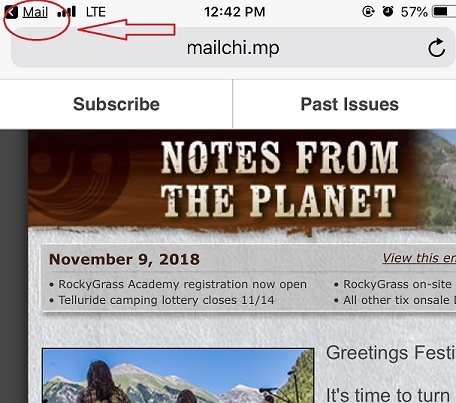 You look at the top left corner where it says Mail, and you tap that to quickly return. You want to take a photo so you turn on your phone, find the Camera App, and open it up. Your coffee is brewing and you want to quickly set a timer. You open the Clock App, select Timer, and then set the timer for your perfect brew. You swipe up from the bottom and select the little timer icon and very quickly set the proper amount of time. You’ve been in a meeting and want to see what notifications you’ve missed while you were out of touch. 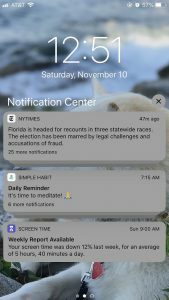 You open each app separately to see what emails, phone calls, texts, and other messages you’ve received. 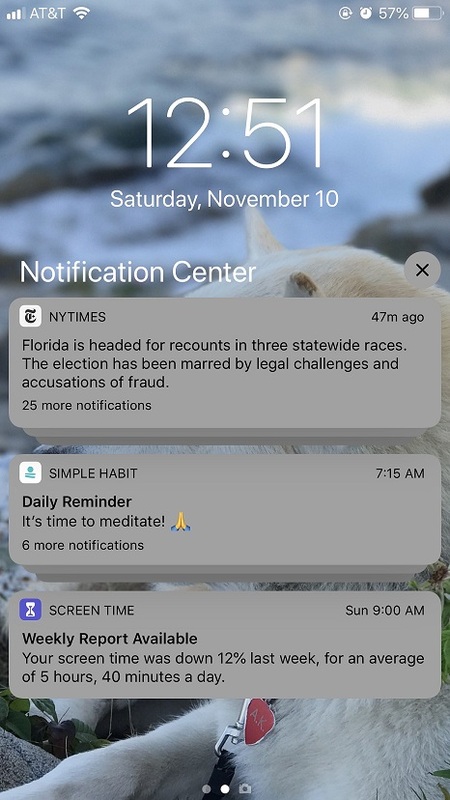 You swipe down from the top of your screen to see all of your notifications at once. You have a slew of options for quick access from the Swipe Up screen. (By the way, you can customize what appears here from Settings. Click on “settings”, then “Control Center”, then “Customize Controls”. Was this helpful? Please forward it to your colleagues! Many of the components in our electronic devices are toxic, so it’s really important to make sure they get recycled properly. 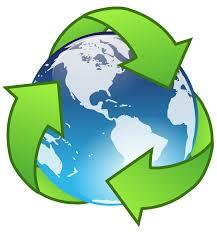 If you just toss your laptop battery in the trash, many of those toxins will leach right into our water supply! Rather than electronic recycling, you can try to sell your old phone, tablet, or computer. You could start with eBay or Craig’s List. You can also try buy-back programs at places like Best Buy, Amazon, AT&T, Sprint, Staples, and Apple. You’ll get a little less money for your device, but it’s really easy to do, with much less hassle than finding a buyer, shipping it, etc. Put the item on your local Facebook page, or post it in your local Freecycle group. But, please make sure that you have removed all of your personal data first! Screen Time – How much time do I spend playing games on my phone?! Several months ago I checked out the beta version of the newest Operating System for my iPhone. (Check out my blog on the subject.) 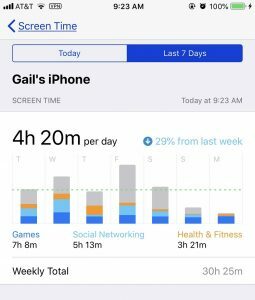 I did this primarily because I had heard about Screen Time, a new app that helps you track the amount of time you are spending on your Apple devices. I only signed up for the trial on my iPad, because, if they were to release a beta OS that crashed the system, I didn’t want to be without my phone. 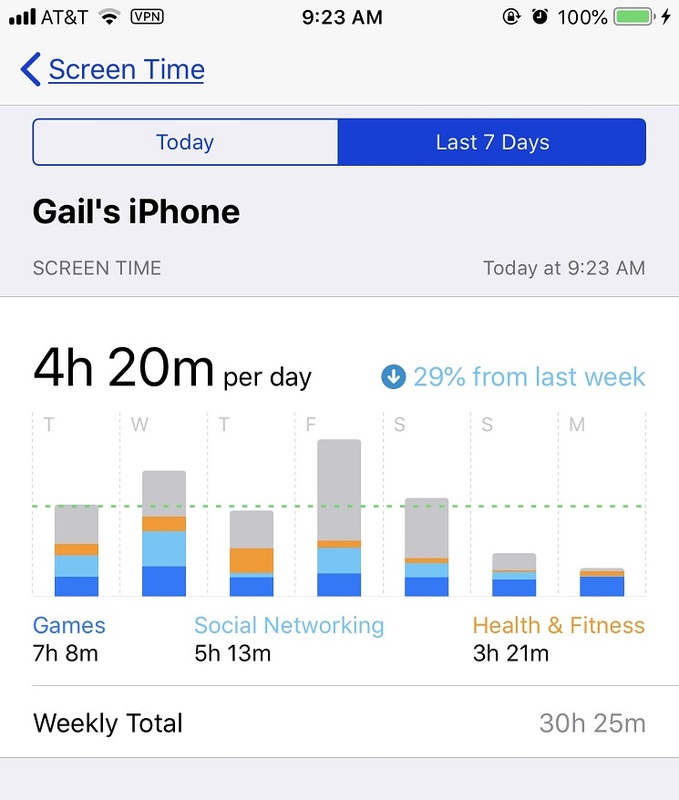 Although Screen Time says “Gail’s iPhone”, it’s really data from both my phone and tablet. 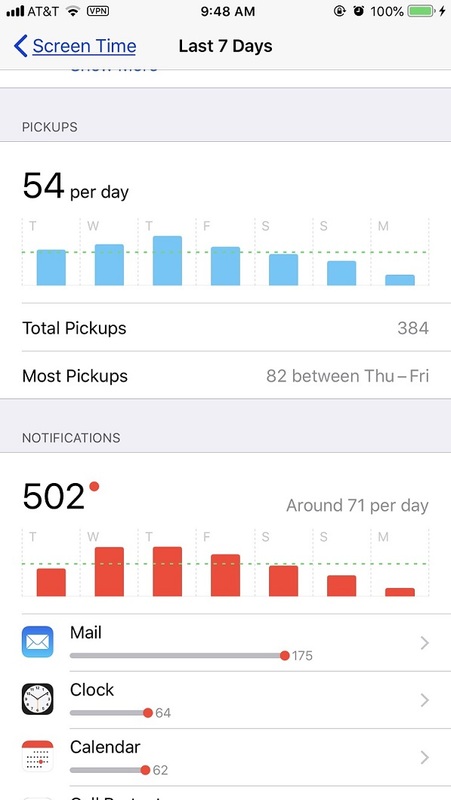 The App also tells me how many times a day I pick up my phone (54 times a day), and how my notifications I get (71 per day). I’ve created a Free Report to protect you from “phishing” scams. Click here for access! You know how we always tell you to delete the history on your web browser on your computer? Well, you need to delete browsing history on your smartphone too. It helps speed up your interactions with the servers. But it also helps keep your data more secure too, since it deletes any installed cookies as well as your entire history. If anyone is able to hack into your phone they may be able to gain access to your login information for any number of websites. It may also help to make you look like a new user to websites that track the number of times you’ve visited. You’ve gotten that message – “You’ve logged on ten times for free. Subscribe now!” I don’t know about you, but I would prefer not to provide my email address to another sales organization and an easy way around that error message is to delete browsing history. It is really very easy to delete your history. Just follow these 5 steps. Confirm that you truly want to delete browsing history. It really will delete all of the open web pages on your iPhone. 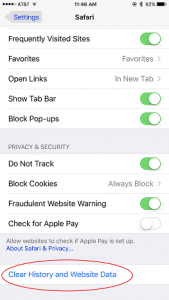 This means that every page you’ve opened in your iPhone’s browser will be gone! This was a surprise to me because I tend to save my open tabs so I can reference them again. If there are tabs that you have open on your phone that you would like to keep, it’s best to save them first, then wipe the history! Chris Eddy of Geek For Hire, Inc. has been providing computer service to families and small businesses with Mac’s and PC’s for the past fifteen years. His company is highly rated by both the BBB (Better Business Bureau) and by Angie’s List. You can find more on our website, or give us a call 303-618-0154. 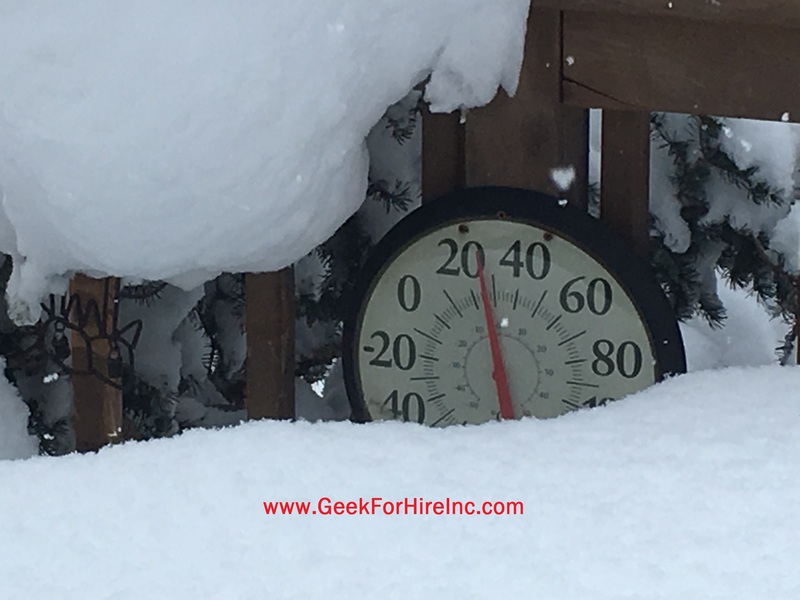 Geek For Hire, Inc. provides onsite service (Tier 3) to the Denver / Boulder / Front Range area as well as remote service throughout North America. Did you get a brand new iPhone over the holidays? There are some things you should do right away to make sure it stays secure and you keep being happy with it. Even if you’ve had your phone for several months, make sure you’ve taken care of these. First – you want to make sure your new iPhone can be locked down. Go to “Settings”, and scroll down to “Touch (or Face) ID and Passcode”. If you’ve already set up a passcode, you’ll need to enter it before continuing to these options. Decide if you want to use the Touch or Face ID, or if you just want to use a passcode. If you do want to use a passcode, we recommend that you select one that is more than four digits. You can select a custom alph-numeric code, or a custom numeric code. 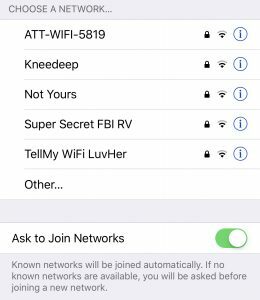 You’ll also want to lock down your Location settings. Click on “Settings”, and then “Privacy”. You can see which Apps get location data and turn off the ones that don’t really need to know where you are located. When I’m on a road trip, I turn on “Hey Siri”. This allows me to have hands-free interaction with my iphone. 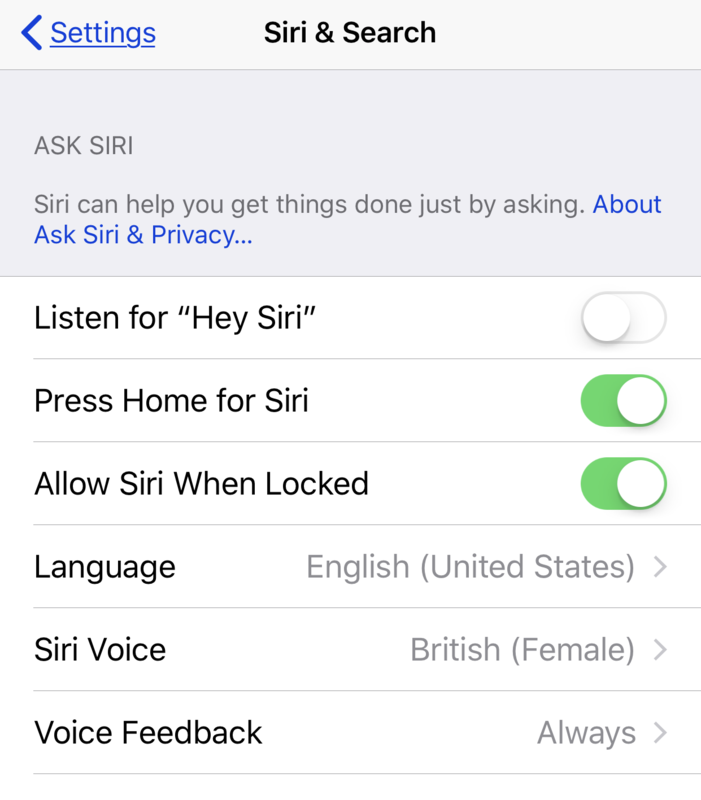 To turn this on, click on “Settings”, and then “Siri & Search”. 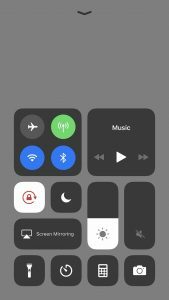 Slide the button to “on” to allow for Siri to listen. 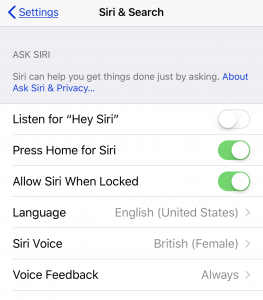 You can also select a language and voice for Siri on this screen. 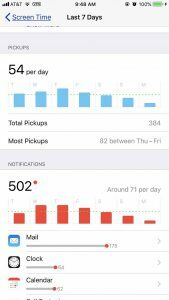 Decide if you want to share analytics from your iPhone with Apple. Apple collects usage data and location information. To turn this off click on “Settings”, and then “Privacy”. Scroll to the bottom and click on “Analytics”. Make sure the button is turned off. Opt out of receiving targeted ads. 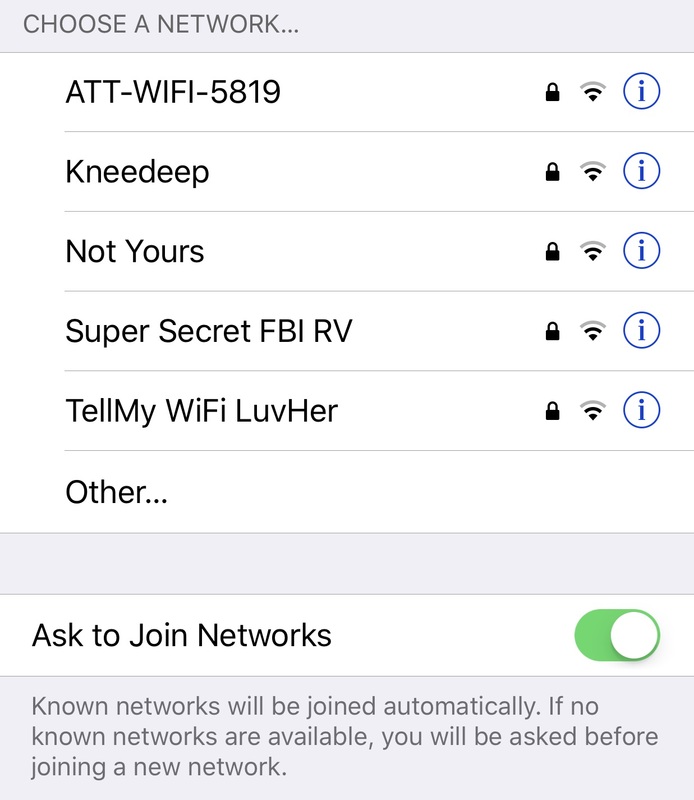 Click on “Settings”, “Privacy”. Scroll to the bottom and click on “Advertising”. Slide the green button On to Limit Ad Tracking. This is a good time to decide what to do with your photos. Do you have a plan in place for saving them off of your phone? I have set up Dropbox to save my photos onto the cloud every day. Do you have websites that you go to frequently? You can add them as an icon on your new iPhone screen by clicking on the up arrow at the bottom of your Safari screen. Slide the bottom row of options over until you see “Add to Home Screen”. Click on that, personalize the text, and then click “Add”. What do you do to set up your new iPhone? Share in the comments below! Chris and I had a conversation this morning about the pesky news sites that limit the number of articles you can read each month. There are some newspapers that I won’t even read online because I get that nasty error message that says: “You’ve reached the limit! Subscribe now!” He told me that when he runs into that, the solution is to delete cookies on your iPhone. WHAAAAAT?! I didn’t realize you could do that. As I started looking into this, I see that there are other benefits as well. 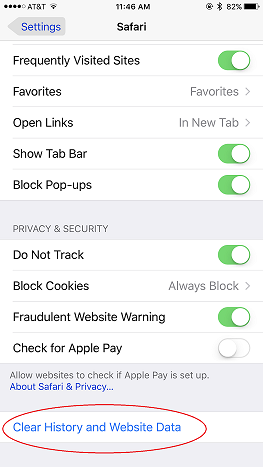 Just like with your computer, you do want to delete cookies on your iPhone regularly to keep your private information safe and secure. And, just like the rest of of the business world, there are companies out there who want to sell you an app to “take care of this for you”. Don’t fall for that trick! It’s easy enough to do it yourself. Confirm that you truly want to delete all of your history. This means that every page you’ve opened in your iPhone’s browser will be gone! This was a surprise to me, because I tend to save my open tabs so I can reference them again. If there are tabs that you have open on your phone that you would like to keep, it’s best to save them first, then wipe the history! If you found this helpful, please share with your friends! The winter holiday’s are coming up and lots of folks will be on the road. 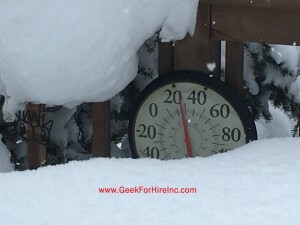 I thought this would be a good time to revisit my list of favorite weather websites and smartphone applications. Weather Underground – My favorite of all the weather websites is Weather Underground. I like it because I have several different weather stations to choose from in my town. In addition to the forecast, WU tells me what’s happening right now. When you click on the information from a particular station, you can also see if they have a webcam set up. Then you can see the snow and wind for yourself! Those webcams are especially helpful if you’d like to see the weather in a place where you are traveling to. You can also save favorite locations, so it’s easy to see what’s going on at Grandma’s house before you get there! WeatherTalk – is a Facebook page. Colorado Weather Analyst Greg Berman gained recognition when he accurately forecasted the extent of the rains and subsequent Front Range floods in September 2013. If you’re on Facebook, I’d highly recommend this page to “Like” and bookmark. His forecasts include most of the Colorado Springs and other Front Range areas. What is your favorite of all the Weather Websites? Share in the comments below! For those of you who know me well, you know that if there is one sport I follow, it’s baseball. I like hockey too, but don’t follow the games and teams as closely as baseball. I really L O V E baseball! I love attending the Rockies games at Coors Field, with the smells, sounds, and excitement. And when it’s time for the World Series, well, I’ll be glued to a TV, or, one of the Sports Smartphone App’s on my iPhone to keep track of the scores! After baseball season was over this year, I started wondering how people who follow other sports get their info. As per usual, any question I have involving technology, however peripherally, gets explored here! 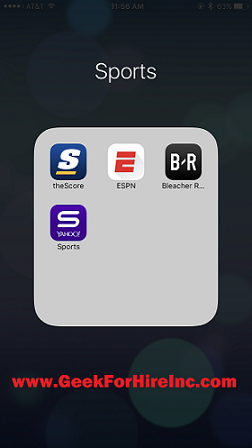 There are a bunch of Sports Smartphone app’s recommended by folks in-the-know. I’ve checked them out and found these four to be easy to use and very easy to customize so that your favorite teams are listed right up front. Which is your favorite sports smartphone app to track your favorite teams? Share in the comments below!